Microsoft is about to launch its latest and greatest Windows 10 , with Windows 10 Microsoft is also putting there brand new Web Browser Codenamed : Spartan and leaked images are providing an early glimpse at the Internet Explorer successor. 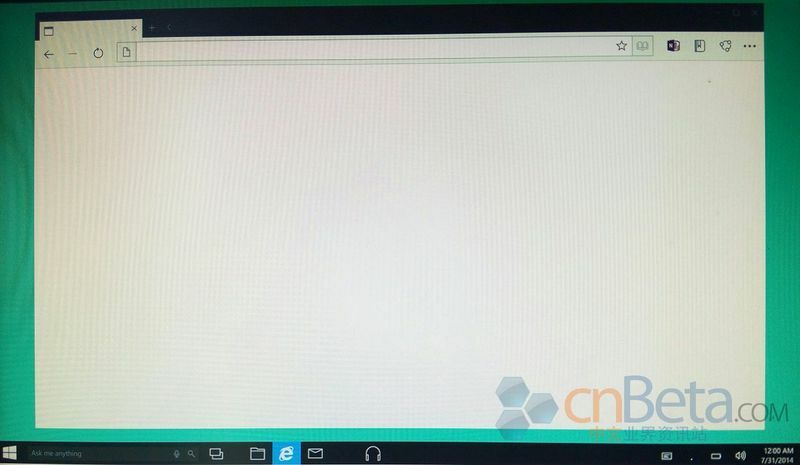 “Cnbeta” a Chinese site leaked screenshots showing the simple interface of Spartan and the Cortana digital assistant integration. Spartan will include digital inking support to share and annotate web pages, and deep Cortana integration in the address bar and throughout the browser. Microsoft is also planning build light and dark themes with color accents for Windows 10. The look and feel will be similar to that of the existing user interface for Windows Phone, and these leaked screenshots provide an early look at an internal Microsoft concept and the aim for the final UI.They do not represent the final interface as Microsoft will be tweaking it a number of times over the coming months. Some of these user interface changes have started appearing in recent builds of Windows 10, with the new dark taskbar surfacing in a leaked version last month. Microsoft is also tweaking its built-in apps to match the new color schemes, with a new Xbox app that hints at what the company is planning for the final version of Windows 10. We expect Microsoft to unveil these user interface changes and a mobile version of Windows 10 for tablets and phones at a press event on January 21st. Microsoft will also likely detail its plans for the Spartan browser across PCs, phones, and tablets. Previous Previous post: What is Quantum Dot Tv’s ?